Editor’s Note: This series of articles first appeared last summer in the comp.arch newsgroup, in a series of posts by John Mashey. Since then, it has been updated, edited and enriched with additional material and graphs by David Kanter, all with permission of the author. The VAX was an orthogonal, 32-bit CISC instruction set architecture and an associated family of CPUs and systems, produced by the Digital Equipment Corporation. The VAX is considered to be the quintessential CISC architecture and VAX systems (often called VAXen) typically used an operating system known as VMS and were shipped from 1977 till 1992, when the line was discontinued in favor the Alpha. In the wake of the death of the Alpha architecture, there have been many discussions regarding the feasibility of cheap, fast and timely VAXen in the early 1990’s. Many have asserted that if DEC had continued with the VAX, rather than transitioning to the Alpha that the company and its products would be in better shape today. Unfortunately, most of this discussion is filled with fantasies about what could have been; the issue is not just what was technically feasible, but what was cost-competitive and time-to-market competitive. This series of articles will examine the issues confronting DEC and the VAX architecture in the early 1990’s. The first part covers some of the economics of systems and microprocessors. The second part in this series will address the competitive challenges that DEC faced around the time of the Alpha. The third and last part will compare the instruction set difficulties facing out-of-order VAX, x86 and s/360 microprocessors and bring everything together. Suppose it costs $50,000,000 to design a chip and get into to production. The amortized cost per chip for engineering versus total unit volume is shown below in Figure 1. Alternatively, if you can sell 5,000,000 chips, then you could spend $500,000,000 on development, and still only have an engineering cost per chip of $100. It is easy to see that as a result of these economics, high volume designs achieve high performance with relative ease. Additionally, higher production at a fab increases the quality of silicon, further improving the performance of a high volume design. 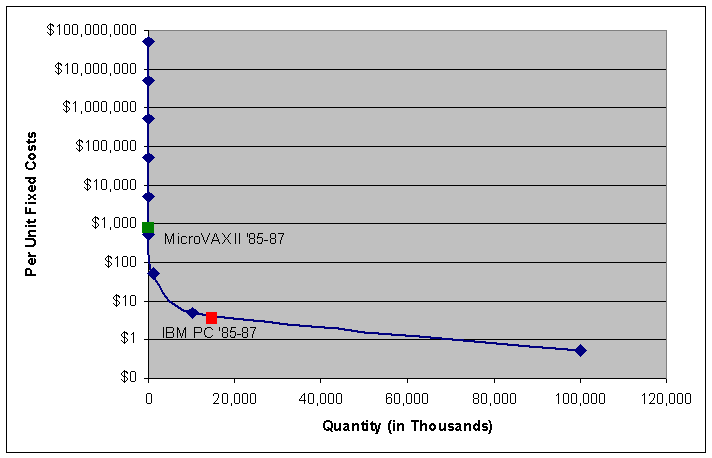 To put this in perspective, I have included the MicroVAX-II and IBM PC volumes over the periods 1985-1987. Under this hypothetical model that assumes equal development costs, the difference in per unit R&D costs is roughly two and a half orders of magnitude.